We have a mailing list of people looking for this bear. I’m looking for a White plush Eden teddy bear. It is white with pink inside the ears. 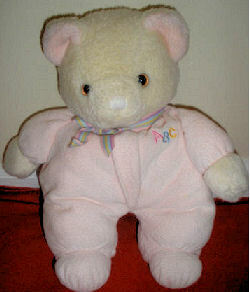 It has a pink velour sleeper with ABC on the upper left chest, as well as a striped ribbon around its neck. Jim writes that he is looking for this bear, too. I have also been searching for the same EDEN teddy bear (Pink Plush with A,B,C on it). My father bought one of these for my daughter when she was only months old. He passed away when she was one and a half, and she treasured it so much that the plush has now gone, and it is just holding together in no more. If you could give us information on where to get another of these it would be very much appreciated. Hi, I’m looking for a teddy bear from Eden purchased around 1998. Its body is pink, with a white head, and it has “ABC” on three blocks on the left chest. Please let me know if you have one of these. Eden is one of the better brands of washable stuffed animals, designed especially for babies, and we always have several of their dolls and toys in stock. We didn’t have this teddy, though, and I couldn’t find it anywhere else, either. I couldn’t even find a picture of it to help with locating it. If you can help Mara and Jim find this special teddy, THIS SITE IS NO LONGER ACTIVELY MANAGED. Please use Our FREE FACEBOOK GROUP, including #011806-1 in the subject, and we will send her your email address. thank you for your post. I have been on ebay tonight and managed to get the teddy bear we have searched for. Several times we have recieved e-mails/comments to say there is one available on ebay, but by the time we get the e-mail and get logged in (time difference from USA to UK) they have gone. But not this time, thank you very much.